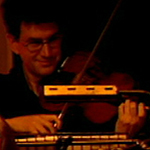 John Metcalfe is a viola player. He has played with the Millennia Ensemble on the albums Absent Friends and Victory For The Comic Muse as well as Joby Talbot’s Aluminium. John has also played with other ensembles, including The Duke Quartet for Joby Talbot’s String Quartet No. 1 & 2.